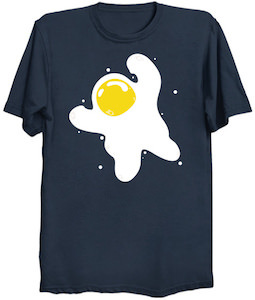 This egg spaceman t-shirt is made for people that love space and eggs. On the t-shirt you can see what looks a lot like an astronaut only this spaceman is made out of a fried egg and the egg white is the space suit and the head is the egg yellow and together it just looks amazing. You can get this breakfast astronaut t-shirt in style for both men and women and it comes in sizes Small – 6XL and in a wide selection of sizes. So space walks became so much cooler because egg spaceman is ready for it and will never get hungry as it can eat itself when out in space. If you want a fun t-shirt for Easter then this is the one. The t-shirt is available in many colors and styles for men, women, and kids. On the t-shirt, you can see an egg shape and in that shape, you can see the Easter bunny sitting on top of a yellow Easter egg that has a banner on it that says “Happy Easter. So if you want a perfect Easter t-shirt then this one would do as it has eggs and a bunny on it and it wishes everyone a Happy Easter. 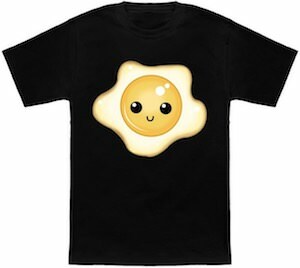 If you like eggs and smiling then this sunny side up t-shirt is what you need. On the t-shirt, you can simply see a sunny side up egg and it looks really happy as it is smiling. And maybe this egg will make you happy to especially if it is ready for breakfast with some nice buttered toast. You can get this fun egg t-shirt in styles for both men and women and all are available in many colors and sizes Small – 6XL. When you wake up tomorrow wear this t-shirt and your breakfast may smile back at you as this egg seems to be super happy to be a sunny side up egg. Are you great at finding eggs? If you are then maybe this Easter t-shirt is perfect for you. 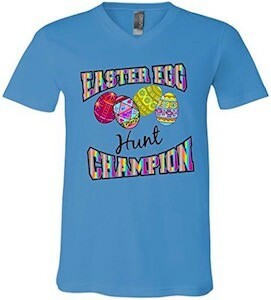 On this t-shirt you can see a bunch of fun decorated Easter eggs and the text “Eater Egg Hunt Champion” witch is also done in fun colors and fonts. So next Easter you can scare your competition by wearing this t-shirt. And to make it more fun this t-shirt is available in 16 colors and it comes in sizes Small – 2XL. Real eggs or chocolate eggs it doesn’t matter they have to be found on Easter so get ready and wear this Easter Egg Hung Champion T-Shirt. Breakfast is the most important meal of the day and did you know it can look like a sunrise to? This t-shirt shows a breakfast sunrise. On the bottom you can see a strip of bacon and on top of that a sunny side up egg as the sun and that makes for the perfect sunrise for me. And this breakfast sunrise t-shirt comes in a men and women’s version in many colors and in sizes Small – 6XL. Why leave the house without breakfast when you can take it with you on your t-shirt. Come and get the breakfast you need with this Breakfast Sunrise T-Shirt. 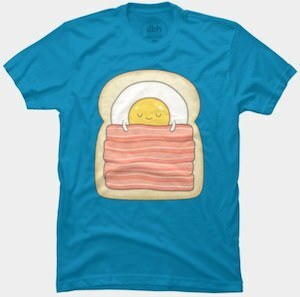 This t-shirt shows a slice of bread with on it a sunny side up egg covered under a blanket of bacon. And yes it looks like the Eggs is sleeping on the bread making it bed and breakfast. You can get this funny food t-shirt in a men and a women’s version in all kind of sizes and colors. And all of them are made from 100% ring spun cotton. 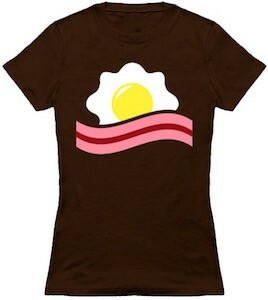 Just looking at this t-shirt makes me hungry for bacon and eggs so maybe wearing it is better as then other have to look at it and drool. Come have a closer look at this Bed And Breakfast Funny Food T-Shirt. If you don’t have you Easter t-shirt yet then this could be the one. 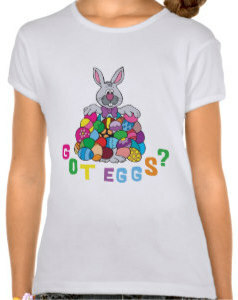 This t-shirt shows the Easter Bunny and a big stack of eggs in all kind of colors and designs and below all that the text says “Got Eggs?”. 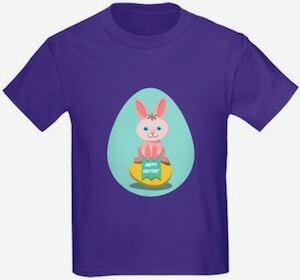 This fun Easter t-shirt comes in all kind of styles, colors and sizes for kids, and adults. Now Easter egg hunts will be more fun when you dress up in a t-shirt like this with a bunny and eggs. Even though Easter will be there only for a short time every year it surely deserves it’s own t-shirt. Don’t let the Easter Bunny wait come and check out this Got Eggs? T-Shirt. 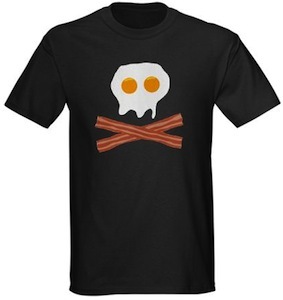 A nice breakfast has bacon and eggs and a nice t-shirt has a skull. This t-shirt does exactly that with a picture of a skull made out of strips of bacon and two eggs. This fun food t-shirt comes in different colors and styles for men and women. So if eggs and fresh bacon is the perfect start of your day then after breakfast order your own come get this shirt and feel like a bacon pirate. This is a funny easter t-shirt saying “Easter is Canceled!” and next to that text your see a broken egg. Of course we all know that the Easter bunny will bring eggs so we don’t have to worry about that but still this t-shirt is pretty funny. And if you like a funny Easter t-shirt like this then you can get this one or one with this print in a different style for men and women and they even come in different colors just like the eggs. 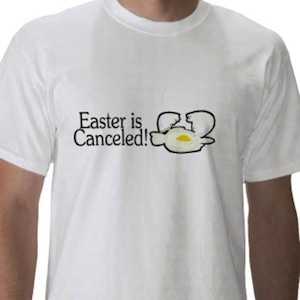 Get ready to cancel Easter with this Easter Is Canceled T-Shirt. Eggstreme surfing that is what this egg loves to do in it’s spare time. And you know it pretty dangerous for an raw egg to surf the high waves. But if you are an extreme surfer then you should see if this shirt fits your closet. And if you just want to look cool then yes this is the funny shirt for you. Go order your own personal Eggstreme Surfer T-Shirt.